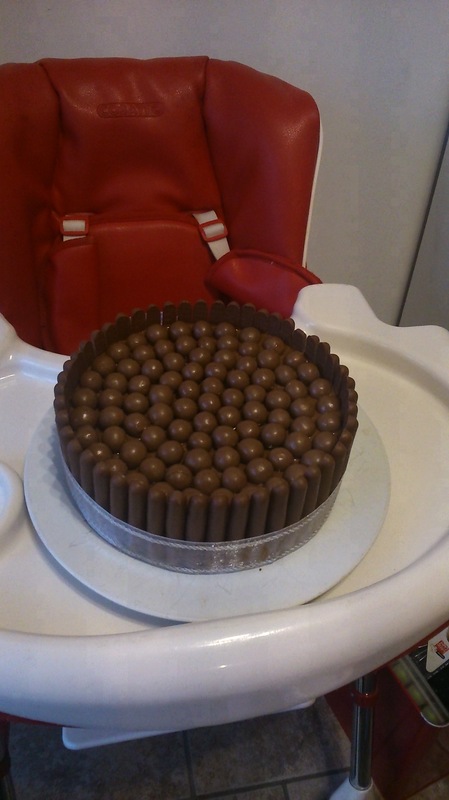 I’ve made this chocolate biscuit cake a few times now, for special occasions. It is really simple to make, and so delicious! Friends and family have got the recipe from me and have been making it since, so I decided I’d share it here. 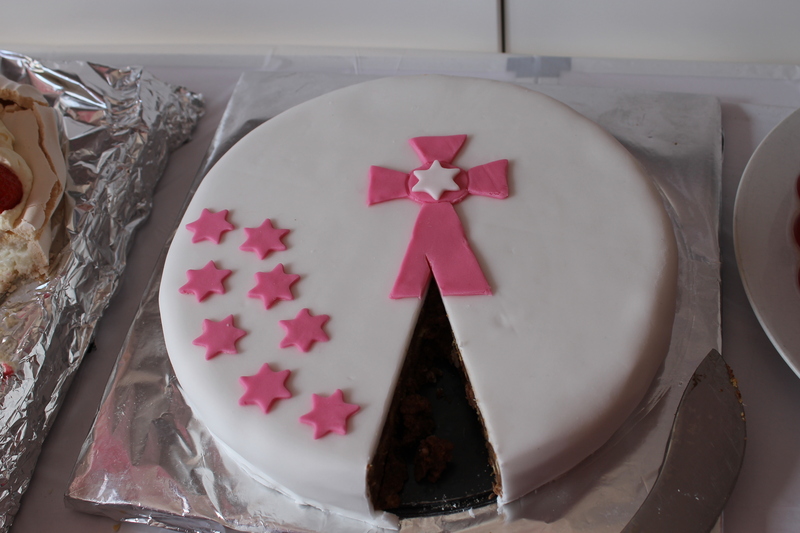 Here is a picture of the most recent one that I made for Princess P’s communion last week, this was much thinner than usual because I used a larger tin! I used the Odlums recipe http://odlums.ie/recipes/chocolate-biscuit-cake/ as a base recipe, and then made some changes (used a bit extra chocolate used a mix of digestives, bourbon creams and a few rich tea, my kids don’t eat raisins and I wasn’t sure who’d eat nuts – so I used the raisin allowance in crunchies, and I used the nuts allowance on mars bar and I added a few extra maltesers too! 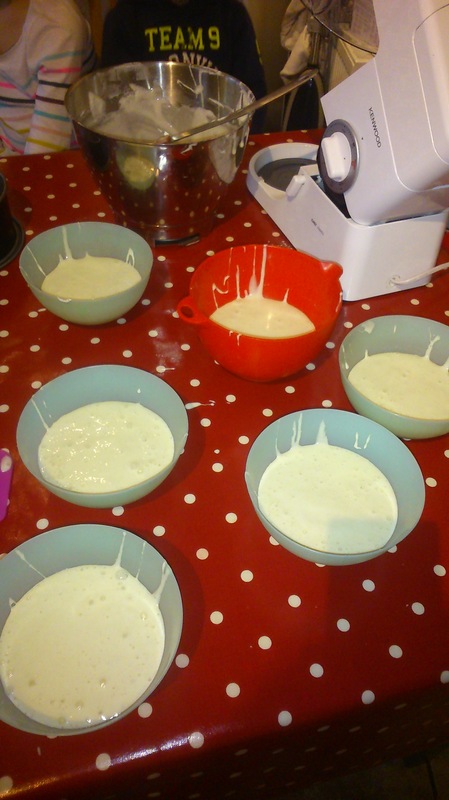 Base recipe recommends to line a 15cms/6″ round cake tin or a 2lb loaf tin with a double layer of greaseproof paper, but I’ve tried it in different size tins with no problem. Because you’re not baking it, the tin size doesn’t matter as much. Melt the butter, syrup and chocolate in a pan over a low heat. Stir to make sure all the ingredients are well mixed together. Add in the chopped mars bars so they soften slightly. Add the crushed biscuits, maltesers and crunchies. Stir well. Transfer to prepared tin. Level it on top and press down well to avoid “air gaps”. Allow to get cold and hard. 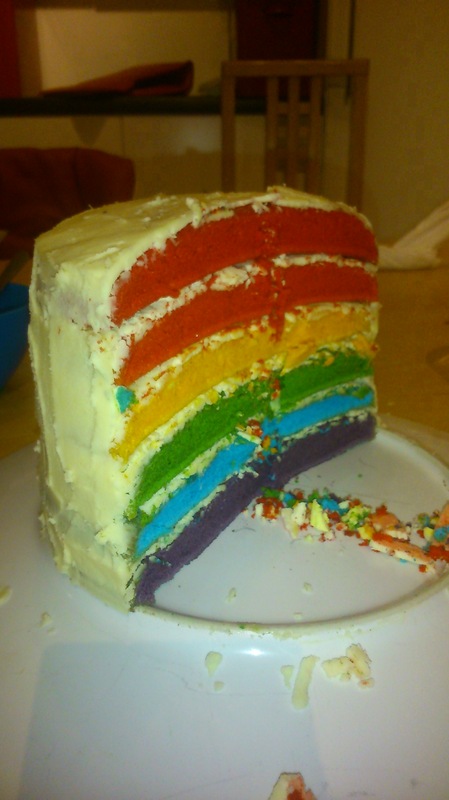 This cake is just delicious. Even before it sets – I have a big problem keeping my spoon out of the pot when the butter, syrup and chocolate are melted together. Mmmm. Here’s one I made for Baba Z’s christening, so you can see they can be decorated any way! 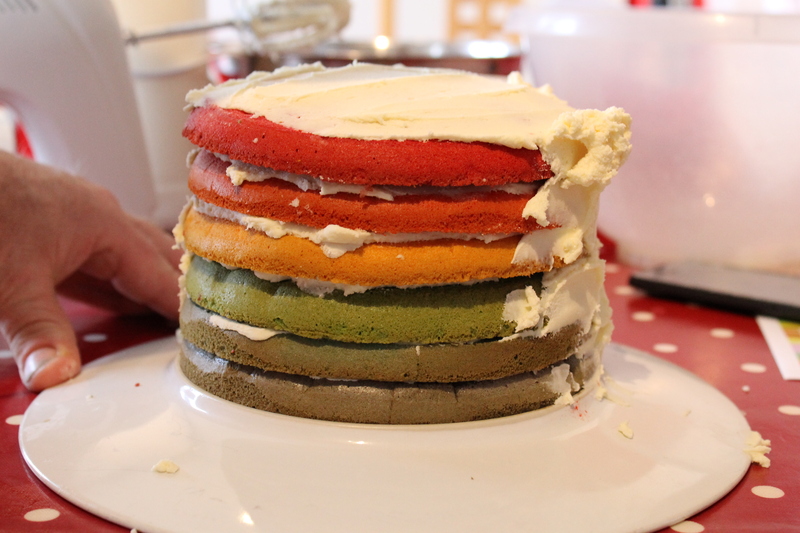 It was the baby’s first birthday a few weeks ago, and I had seen rainbow cakes last year and I really wanted to make one. I had planned to make it for my other half’s birthday but when I looked up recipes I realised I needed to use gel colours or it could look wishy washy. So I ordered the gels and planned it for the 1st birthday instead. A friend, who had a cake business, told me the key to good colours was to use a yolk free batter, so I found a recipe for an angel food cake. 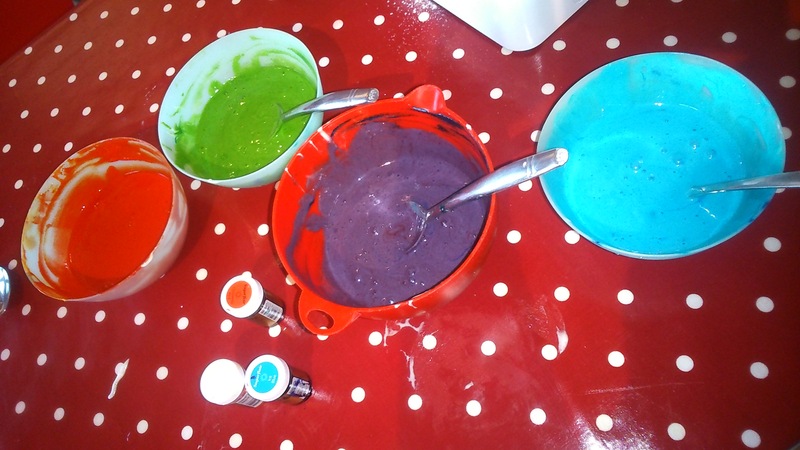 The recipe I used had 12 egg whites, and you beat them to nice and puffy – but of course once you split it between six bowls (it loses a bit of air, and “puff”) and then mix in the food colour gels, it had lost all its air and all its puff. Which I think then affected the texture and taste. I had a bit of an issue with my orange layer. I decided to work through the rainbow starting at red, then orange. I put in equal amounts of red and yellow food gel to make the orange, not realising that the red dye was extremely strong. I ended up having to put about half the jar of yellow food gel into it, and still in the bowl it looked red. It didn’t look at bad once it actually baked. 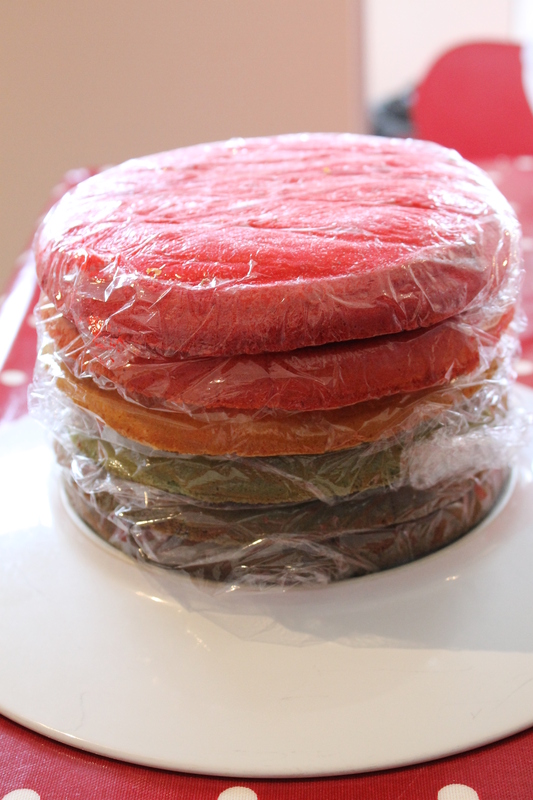 Once they were cooled, I wrapped them in clingfilm and put them in the fridge overnight. 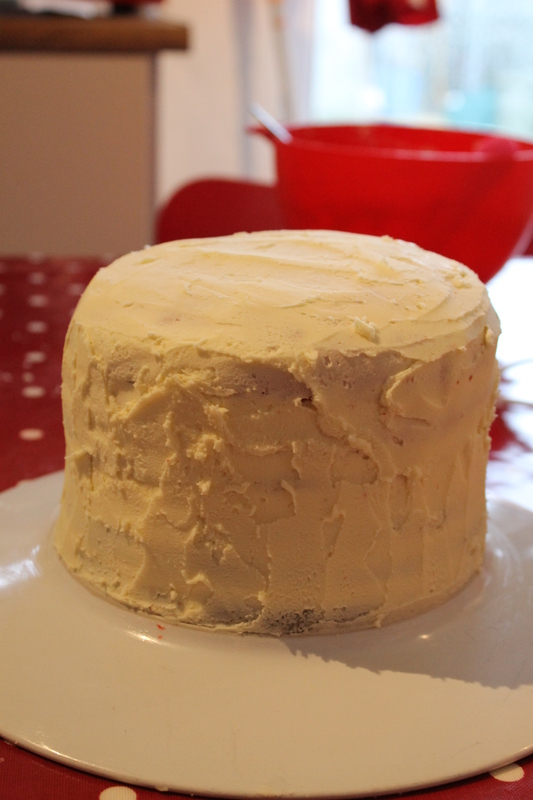 Next morning I made a lovely white chocolate buttercream icing (that I found the recipe of here: http://allrecipes.co.uk/recipe/16140/white-chocolate-buttercream-icing.aspx) and added a layer in between and on top. The fun began when I tried to do the sides. I just didn’t have the patience, it kept falling off. Luckily, the other half stepped in, with a hot knife, and his nice calm patience! I was very impressed. Now, I must admit that the sponge was not lovely and light, or moist and tasty – it was dense and rubbery to be honest. I think that if I was to make it again, I would just use a normal cake batter, egg yolk and all. 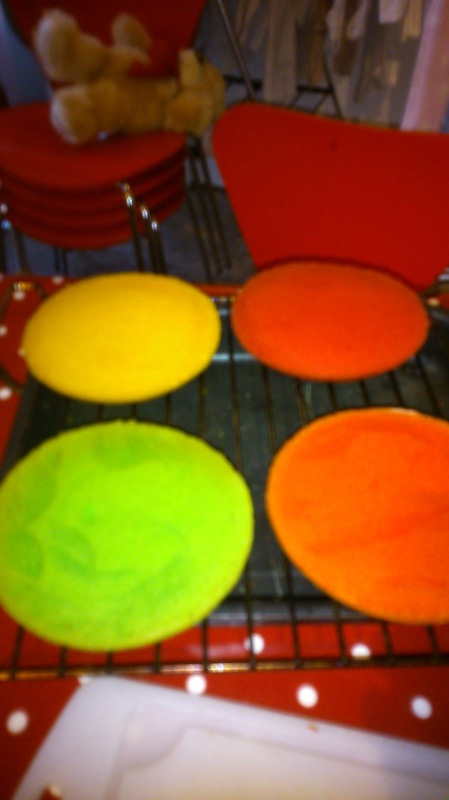 What do you think, taste or looks – which is more important in the case of a rainbow cake?